When Do Gardenias Bloom in Florida? Gardenias produce white flowers with shiny, dark foliage surrounding them. In Florida, Gardenia jasminoides grow best. Proper environmental conditions encourage maximum growth and the best possible flower production. Gardenias produce large white blooms. Most cultivars bloom in the spring. Others may bloom throughout the growing season. Examples include the Aimee Yashioka that blooms in late spring, the Veitchii and August Beauty that bloom from spring until fall, and the Coral Gables cultivar, blooming in the summer. 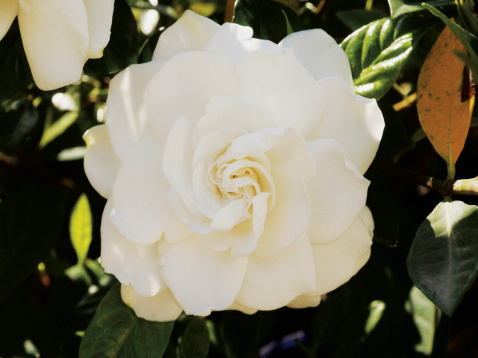 Gardenias planted in shady areas may bloom late or flower less profusely than those located in areas with full sun. Pruning in October or later also decreases blooms during the next growing season. Bud drop affects blooming gardenias due to insects, diseases or poor growing conditions. This causes the plant to lose its buds before they open, and thus not bloom at all. Examples of problems causing bud drop in gardenias include thrips, aphids and quick temperature changes. Thomas Urbauer has been writing professionally since 2005, contributing online articles covering home and garden and other topics. His areas of expertise include gardening, business and electronics. He graduated from the University of Nebraska with a Bachelor of Arts degree in journalism and mass communications. Can Maple Trees Grow in Florida? How Much Sun Do Azaleas Need?